I’ve been working hard to take off excess weight, primarily with the Medifast “Take Shape for Life” program as well as Farm to Fit local meal service. This new program gave me impetus to enjoy smoothies as snack meals and get creative with ways to make them nutritious. Enter the kefir. I got samples of Lifeway Protein Kefir, a natural probiotic kefir packaged in 16 fluid ounce containers. It has very little added cane sugar and is 1:1 protein to carbohydrate content. Kefir is a fermented milk product, much like yogurt but with more active yeast and bacteria cultures. It is thinner than most yogurt, a thick liquid that can be a little fizzy from active fermentation. As a former microbiology technologist, I am a believer in keeping your gut microbes happy. There are entire new theories of many diseases that think they are caused by or made worse by having off-balance gut microbes. Probiotic foods like kefir can introduce good microbes back into your personal ecosystem and may help restore the balance. There isn’t a lot of research on it, just many food traditions and newer theories. It is also naturally low in lactose because the probiotic microbes have digested most of it. That is good for those, like me, who avoid milk due to lactose intolerance. 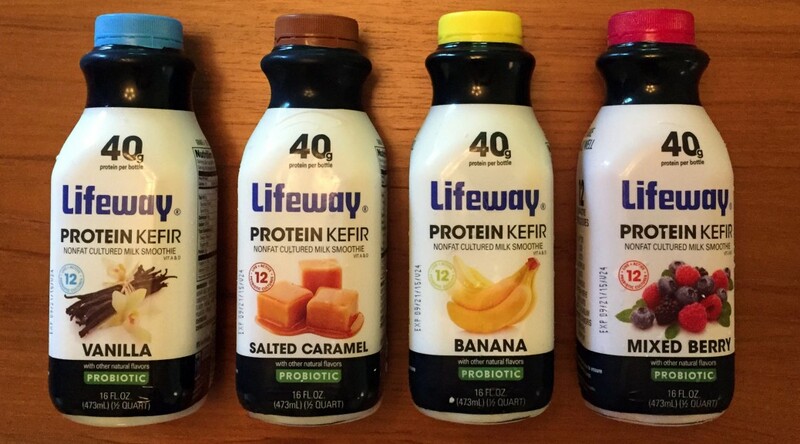 The Lifeway Protein Kefir comes in flavors such as Salted Caramel, Banana, Berry and Vanilla. It is tart but pleasant. They encourage you to drink half of a 16-ounce container after exercise to provide 20 grams of protein to restore and build muscle. That is 160 calories. I also used it as a quick diet snack, drinking about four ounces of it for a quick 10 grams of protein/10 grams of carbs. That can help stave off hunger while providing calcium and B-vitamins. But it also makes a good low-lactose substitute for milk when making a smoothie. I’ve been playing with kale and banana smoothies and pumpkin smoothies. The kefir provides a great protein base and smooth texture. I freeze the bananas and pumpkin to add in when blending, along with some ice chips. While some athletes use protein powder in smoothies, I am just very distrustful of it. I’d have to be sure they weren’t sourcing any protein from China (where it might be adulterated) and that it doesn’t have any additives. I like the Lifeway kefir for using natural flavors and a very short list of ingredients. While Lifeway kefir is low in carbohydrates and added sugar, some kefir you may see in the market might have more sweetener added. Be sure to read the label.